There is a very popular book out at the moment called ‘This is going to hurt’ by Adam Kay and it’s the memories of a Junior doctor. My mother read it and found it very amusing and heart-breaking at the same time. 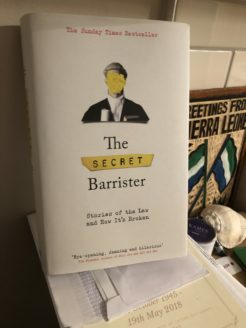 I assumed ‘the Secret Barrister’ was along the same lines and so had placed it on my Christmas list. Daughter number two duly obliged and so, stuffed with over indulgence and a cold virus that was preventing me from running, I settled down for a good read! This book has nothing in common with Kays book. It is not funny. There is nothing funny about a criminal justice system which is so flawed at every stage that seasoned criminals know how to exploit it, whilst the innocently accused could stand to lose literally everything. As is always the case, there are many hard working decent people who daily strive to keep the structure going but it appears to be a thankless task. Underfunded police forces and cuts to the CPS mean that many cases get thrown out of court as vital procedural information is not collected or at worst lost. The struggling barrister can attend a magistrates court with no knowledge of the cases he is dealing with and can have literally 15 minutes to prepare. Our friend describes the magistrates court as something akin to the wild west and openly confesses to learning to ‘wing it’ as he is handed over a four foot high pile of files which constitute that mornings seven trials of which the first starts in 10 minutes! And yet, these are peoples lives, and I can only imagine what it must be like to be in the system with the potential for Crown court, imprisonment, loss of earnings, loss of job, loss of life partner etc. The writer sympathetically describes the size of the stakes. A few myths are also busted and none more so that the fact that a Judge does not have a gavel and that no money changes hands when it comes to bail. The other big myth our author is keen to dispel is that this is a well paid career. It would appear that due to the Government fixing the costs, the hourly rate is pretty poor. However, like nurses, it seems that for many, the desire to see justice served, and the genuinely guilty ‘beyond reasonable doubt’ be put away and the genuinely innocent be exonerated is a sufficiently high calling. I have to admit to finding it a tough read. Partly this was my fault because of my misconceptions about what the book actually was, and partly because a Kate Atkinson awaited me when I finished (has she ever written a weak novel?) but mostly because it scared me. It is always easy to throw money at a problem, but the cutbacks to the CPS and to the police have simply gone too far and this is meaning too many cases of bad people getting away with crimes and too many victims remaining traumatised and resentful that justice has not been served. This is a political book and whilst I have been guilty of lapping up red top rhetoric around lenient sentencing and easy prison life, this book gives a very balanced view on the political points scoring this kind of rhetoric actually is. I would recommend this book simply for its elucidation of a subject I knew very little about but its 343 pages seemed a tough stretch in comparison to other similar incarcerations!